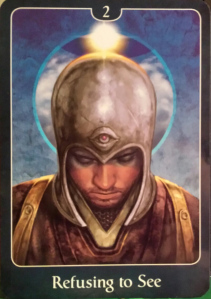 This card asks you to step back from your current path or thought process and review the situation you’re asking about. 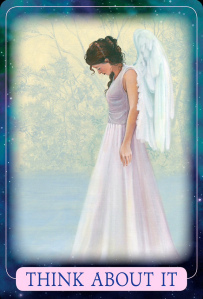 There’s an unseen aspect, and the angels guide you to slow down so you can move forward with the whole picture in sight. This card can also be cautionary, if you were about to make a radical change impulsively. While it may still be the best path, this card asks you to look into the alternatives first. As an Indigo, you’re exquisitely sensitive to energy, and your mission is to heal and transform negative energy into positive. However, there’s always a better way to do so. Henceforth, you are asked to research your options for making the healthful changes that are part of your Indigo mission. 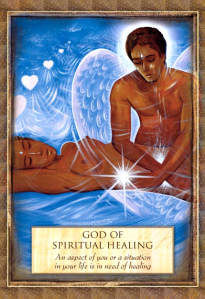 Our card for today, Wednesday, July 9th, is taken from The Psychic Tarot for the Heart Oracle Deck by John Holland – 2 Refusing to See – Key Words: Assess, decide, impasse, and honesty.